Like an impossible fairytale task from Rumpelstiltskin – who ordered the miller’s daughter to spin straw into gold – all attempts to preserve beauty must fail. Anya Gallaccio’s Preserve Beauty, however, valiantly takes up the challenge. Five hundred red gerberas are pressed between a sheet of glass and the wall, in a rough grid formation. Pretty maids all in a row. In time, the flowers begin to decompose, assisted by the glass press. Withering and shrivelling, they fall out of place, or to the floor, slowly rotting. What begins bonny and blithe, turns dull and crackled, and covered with a fluffy grey mould. 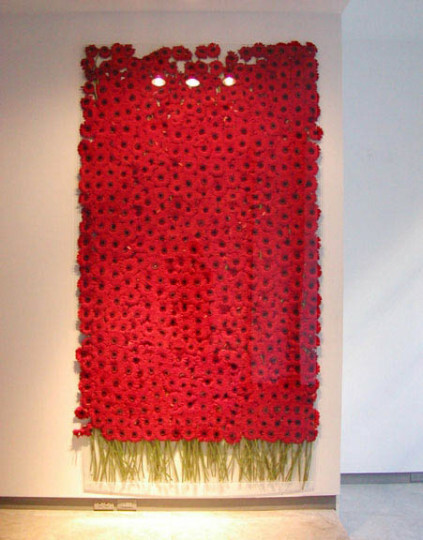 In a previous incarnation in 1991, Preserve Beauty was installed in the window of Karsten Schubert gallery in London, so that the flowers faced out to the people passing in the street. Inside the gallery, the green stalks seemed to ‘face’ away from the viewer, which highlighted the anthropomorphic quality of the gerberas – showing off and jostling for attention. Their fading dying ‘faces’, both in reality and in the memories of those who saw them in the window, align the work with Tense II (1991), from the same year, in which the artist placed a group of unfixed photographs under a skylight so that the faces gradu¬ally faded from view. Gallaccio’s mutable flower pieces defy any illusion that we, as specta¬tors, are privy to a transcendent or authentic experience – there is no true moment, no definitive point of view, for our encounter with this art, as the work we witness today will have changed in a week’s time, and ultimately remains as elusive and changeable as that mysterious entity, the self. Discrete experiences of beauty and art are pinpricks in large acres of time. Flowers are slowly grown, and then, in one quick moment, cut – and at their very prime. The ‘unbearable’ nature of beauty, as described by Albert Camus, is the offer of ‘for a minute the glimpse of an eternity that we should like to stretch out over the whole of time’. Preserve Beauty may thus be read as a knowingly futile attempt, searching for beauty in the long process, rather than the fleeting moment. However, whilst Gallaccio’s sculptural installations might seem celebratory, there is an implicit violence in her work, related to the 500 tiny deaths that we see before us. This relationship might be read through the colours red and green, complementary colours that have figured in several of Gallaccio’s most important works. Red on Green, for example, exhibited at the ICA in 1992, consisted of the red heads of 10,000 tea roses placed on a bed of green stalks and thorns. Over time, the fat floating blooms shrunk and died, to reveal the sharp thorns beneath. The connotations of the two colours are well known – red with passion, death, and blood spilled, and green with new life of nature: both beautiful, both violent. It is, to borrow the title of a wood¬land scene by Gallaccio, the way things are – green with red (2000).
. Shown at the Museum of Installation, Site Three, Surrey Docks, London (1991).
. Ralph Rugoff, Anya Gallaccio: Chasing Rainbows (Glasgow / Newcastle-upon- Tyne: Tramway / Locus+, 1999), 12.
. Albert Camus, Notebooks 1935–1951 (London: Marlowe, 1998), 6.
. Red on Green was last shown at Tate, in ‘The Art of the Garden’ (2004). Private collection.